And that’s a major feat when you consider that Jules’s career means frequent morphing from color to color, or going blonde on top of blonde – sometimes on a monthly basis (not easy on the hair, as any pro knows). “If she’s working or on camera a lot, then we color pretty often…because with all of the close-up shots, interviews, etc, it needs to be fresh.” Bottom line? Jules and Jill get together at least every five weeks in the salon – or, when duty calls, even the occasional on-set hotel room for color maintenance. But this time was dramatically different when Defy Damage was added to the routine. 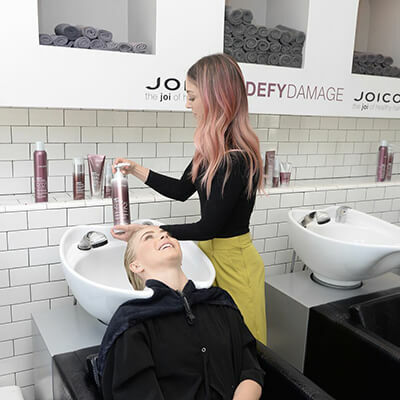 “This is truly the next generation of bond-building for the hair,” raves Jill of the brand-new technology that starts with ProSeries 1 – Joico’s Bond-Protecting Color Optimizing Spray. This easy product begins the process of healthy-hair transformation by turning a salon chemical service into something strikingly different. With its easy spray-on application, Defy Damage instantly goes to work, strengthening and rebuilding bonds, heightening product performance, and providing powerful (and immediate) damage protection right before your eyes. It’s completed with ProSeries 2 Bond-Strengthening Color Treatment, at the shampoo bowl, where those same breakthrough ingredients — Arginine, Moringa Seed Oil, and a Protective Lipid — team up with Joico’s SmartRelease Technology, a one-of-a-kind liposome delivery system that continuously releases powerful Rose Hip Oil, Arginine, and Keratin. Step-By-StepStep 1: Spray Defy Damage Pro Series 1 throughout the head. First, shake the can vigorously and then spray in short bursts, starting at the nape and working forward. Focus the spray down the hair shaft. Comb through for even distribution. Step 2: Using Formula 1, add highlights around the hairline. Step 3: Add highlights throughout the back of the head. In Zone 1, the scalp to mid shaft, use Formula 2. In Zone 2, the mids to just before the ends, use Formula 1. Leave the ends of the hair out. Step 4: Add highlights throughout the top and sides of the head. Use Formula 3 in Zone 1 and Formula 1 in Zone 2, leaving out the ends again. Step 5: Process and lift to a pale-yellow level 9-10. Step 6: Shampoo with Defy Damage Protective Shampoo. minutes, then pull through ends for an additional 5 minutes. Step 8: Rinse and apply Defy Damage Pro Series 2. Process for 5 minutes. 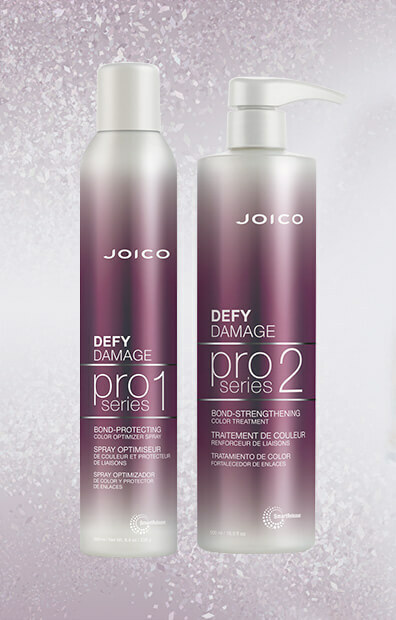 Step 9: Apply Defy Damage Protective Shield on damp hair and style as desired.